Face up – the supine sleep position affords the infant a clear airway, optimises their drive to breathe, and enhances the gag reflex. Putting babies to sleep on their backs reduces the risk of SUDI. Babies are less likely to roll onto their front (the most dangerous sleep position) if they are put to sleep on their backs rather than their sides. Face clear – ensure the face is clear of loose wraps and bedding, free from other people who might overlay the infant, free from gaps that could trap or wedge the infant, and free of objects (eg soft toys, pillows or pets) that might cover the face, cause strangulation or restrict breathing. If wrapped, it must not restrict breathing, and for older more mobile babies (over three months), allow the arms to be free. Free of the risk of wedging – avoid using ill-fitting mattresses in cots. Babies can also become trapped or wedged if there are gaps between the frame and the mattress around cot sides or with saggy porta-cots. Smokefree – babies that are exposed to tobacco before or after birth have less drive to breath with decreased arousal and are at greater risk of apnoea. Tobacco exposure before birth also increases risk of low birth weight and pre-term birth which increases the risk of SUDI. All pregnant women and mothers are advised and assisted to stop smoking and offered referral to smoking cessation services as outlined in the Ministry of Health’s recommendations. make sure baby is kept at a comfortable temperature to avoid overheating. In the same room as a responsible carer – babies that sleep in the same room as a responsible carer have reduced risk for SUDI. Please note a person that has used alcohol, illicit drugs and/or sedating medications cannot be the assigned responsible carer, as their ability to care for the infant is impaired and has been linked to increased risk of SUDI. Please note a very tired adult may also have an impaired awareness to respond appropriately to the baby. Breastfed – breastfed babies have reduced risk of infection, increased arousal, and reduced risk of SUDI. Immunisation - immunisation protects babies from many childhood diseases and is also associated with a reduced risk of SUDI. Pepi-Pod® - a Pepi-Pod is a general purpose storage box that converts to a baby sized bed with the addition of an attractive cover, fitting mattress and bedding. It offers babies a safe protected space when they sleep in, or on, an adult bed, on a couch, in a makeshift setting, or away from home. 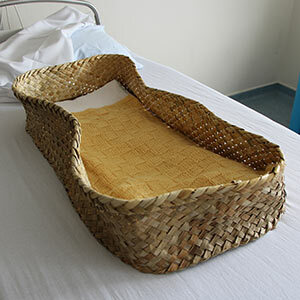 A Pepi-Pod is an intervention measure that reduces the risk of unintentional suffocation and SIDS, and is a response to the high rates of SUDI for Maori, and the risks associated with bed sharing and maternal smoking. A Pepi-Pod is suitable for baby from birth to six months of age. When a baby is old enough to roll over, or begins to grow out of the space, then it is recommended that the baby move into a larger safe sleep space, for example, a standards compliant cot. Skin-to-Skin – mother-baby skin-to-skin contact is where the naked baby is placed prone on the mother’s bare chest, and then covered with a warm, dry blanket or towel. Mother is awake and alert during this practice, or has someone in the room supervising the activity who knows to watch for warning signs of impaired or inadequate breathing. P - PLACE baby in his or her own baby bed. E - ELIMINATE smoking in pregnancy, in the whānau and in the home. P - POSITION baby on his or her back to sleep. E - ENCOURAGE and support mum, so baby is breastfed.